Microgaming launched their first mobile casino software as early as 2004 when high powered phones weren’t the rave yet. Graphics weren’t as good as it is today but that didn’t stop Microgaming from improving their software through the years. Now, Microgaming is keeping up with their reputation as a leader in the field of mobile gaming and they are upgrading in a fast pace. With advanced mobile phones released almost every month, Microgaming mobile casinos try their best to keep up with it. Mobile gaming is said to sky-rocket the gaming experience in the future. It is already in full blast today but who knows how it will shape the future of mobile gambling. Microgaming, being in the sector of firsts is expected not to be left out. Recently they have designed the GameWire software platform that will keep everyone up to date. Microgaming has the biggest portfolio of games in the online casino industry and they are adding more. This is easy for them being the world’s largest online casino software provider; they can quickly bring in new games into the mobile market. This is why they are utilized by online casino companies because of their efficiency and their high quality service. 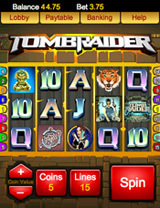 Recently, Microgaming mobile casinos has added eight more games to their directory. These eight new games, just like the previous ones, can be played on various hand held devices such as smart phones and tablets. These games however, are not exactly new but are simply redesigned and transformed into a new one so they will correctly function in the more advanced devices. One example is the games created for HTML5 that has the cutting edge qualities designed by Microgaming for the most advanced mobile devices. HTML-4 games are still available for older smartphones but are still as good with its rich graphics and dual mode functionality. Java is still utilized to cater to the large number of Java based devices worldwide found usually in developing economies. For the advanced phones, there’s the high definition feature that automatically detects the screen size and resolution of the device to fit accordingly. This high definition feature gives a super clear and sharp display which improves the gaming experience. Microgaming has also developed an HTML5 program for banking and registrations. The HTML5 upgrade utilizes the ‘swipe and tap’ interface for great player experience. The GameWire created by Microgaming is said to be the safest and the most secure mobile gaming for real money transactions but all in all, the Microgaming platform is highly-secured. Sensitive data are stored in an encrypted database using various standard protocols. As for fairness, their Random Number Generator has been certified eCOGRA, an organization for player protection and standards organization. Big online casino companies who have built a mobile counterpart have trusted Microgaming for their mobile casino games. All Slots Casino, Wild Jack Mobile, and 32Red Mobile all utilize Microgaming mobile casinos to ensure that the best kind of mobile casinos are enjoyed by their loyal players. Microgaming has set a stone path in the world of mobile casino that will be always remembered through the years. Iconic games such as Hellboy, Tomb Raider and The War of the Worlds are just a few in the long list of games that changed the world of mobile casino for the better.